Photograph of PEPL’s MPD thruster on display. 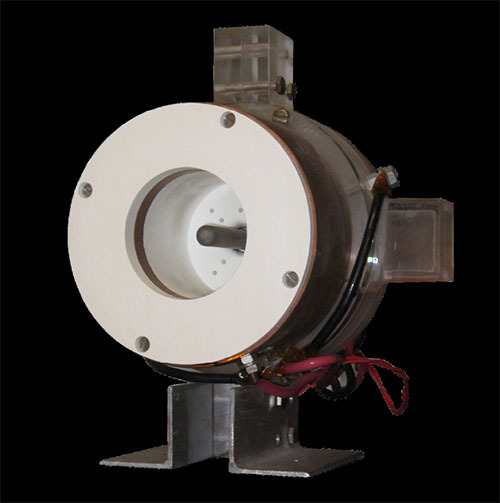 This applied-field pulsed MPD thruster was provided by the Air Force Research Laboratory (AFRL) and is based on Prof. Gallimore’s graduate work at Princeton. The thruster was tested at PEPL in a collaboration project with NASA Lewis Research Center (now GRC). The goal of the project was to study the suitability of the MPD thruster for 10-kW class solar electric orbit transfer vehicle (SEOTV) missions.